After speaking about new DragonForce's album "The Power Within", we have the pleasure to talk with Herman Li, guitar and backing vocals of the band. Hi Herman and welcome on our Italian webzine Alone Music. Before we get into your new upcoming album, “The Power Within”, would you recap the events after the departure of ZP Threat from the band? After ZP’s departure from the band DragonForce took some time to not only start writing the new album, but of to search for a new vocalist. This was done through the DragonForce website and was announced as a worldwide search, whereby people would send in audition videos of themselves. There were many great applicants trying out for the band and it was a long process to single out the best and most suited singers. Eventually (after reviewing many auditions!) we decided to take the best applicants to the next level and ask them to record some further videos. Eventually we rehearsed with Marc, recorded demos with him and got to know him. We gave him the job after about 8 months since his first video submission! It was a long process with a lot of stiff competition! You have been working on a new album since early 2010 but only in March of 2011 you have announced your new singer, Marc Hudson. Have you already had the material ready or you've been waiting for the best time to release it? For example, "Thunder Cry 'was already written on 2011 but appears only now in new album. A lot of music was being written before Marc joined the band. But there were many changes that occurred through jamming the songs together as a band. We actually played the songs together before the vocals were recorded. This was to allow Marc to put his own stamp on the songs / gel with the band, instead of going straight into the studio to record immediately. This made the recording process longer, but as a result the album sounds great! So it was worth taking time over it. How and why you chose Marc as a new singer? How is the relations within the band? Well, from looking at his audition video, we definitely saw a lot of the attributes we’re looking for in a singer. He has good tone, and power, and has a wide vocal range. But we really saw this when we started jamming together as a band. I think the best thing about Marc is that he is a fast learner. This is very important for a new guy, especially as he has no past experience in a professional band! Personally, I think he’s getting on very well with everyone in the band, and I think he’s brought the band closer together… As the new guy, everyone is willing to help him and with that, we’ve all been hanging out more as a band. Let's move into your new album "The Power Within" that is an energic storm of power with great riffing and drumming. How was born? And do you think that you've changed your way of composing music compared to the past? I don’t think that the way the album has been written has changed too much since the last album; but I think that the time off between Ultra Beatdown and The Power Within allowed us to reflect on the previous albums and really take the time to look at the good things and make them better! UB and Inhuman Rampage were really about going over the top… Guitar solos, video game sounds, long songs etc. But I think this time the songs are on this album are more like Sonic Firestorm. The songs are excellently written, and really organic feeling. I think you can really hear this on the album as a result of all the jamming we did before recording. But not only that, the album is the most diverse DF album to date. There are a couple of mid-tempo songs on there, some insanely fast songs and even an acoustic song on there! So there’s a lot of variety and the occasional space to breathe on this album! Talking about songs in the tracklist, are they linked by a common thread or each has its own self-conception? Each song on this album has its own special meaning. A lot of time was spent on the lyrics so people can really understand what the songs are about. There’s actually a brief explanation of the lyrics of each song in the album booklet, so I suggest the fans read it! The Power Within encompasses many issues and themes, but each song really tells its own story and has its own meaning. What were the influences that each of you put in the album? How did you work on songwriting? The songwriting and production were again mostly from Sam and Herman respectively, with songwriting contributions from both Fred and Vadim. This time each member of the band was utilized to do what they do best, contributing to lyrics and musica that have added colour and diversity to the album. You have been in the business since long time, you have seen the scene develop during decades, bands and trends come and go. How do you look at the scene nowadays compared to the past when you started? I think the scene today is the same as it ever was. There are always bands that are big within certain age-groups and demographics. Music is not only something you just listen to, it creates social occasions for like-minded people. Bands come and go, but there will always be a scene for something. I think these days, the metal scene in the UK is pretty diverse but still more geared around ‘roarrrr’ vocals! 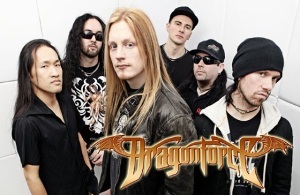 What do you expect for DragonForce in this 2012 after your new album release? I remember you that it's Maya's year! We’re starting the world tour in a couple of days. So 2012 will be filled with loads of fun shows and obviously the release of the new album! Also this will be a chance to travel the world with the new line up and spread the power within! I know it is the year of the Dragon!! !